One of the two bombs posted from Yemen last week was transported on two passenger planes before being seized in Dubai, Qatar Airways has said. The device was carried on an Airbus A320 from Sanaa to Doha. It was then flown on another aircraft to Dubai. It contained the powerful explosive PETN, which is difficult to detect. Yemen has meanwhile granted conditional release to a woman who was arrested on suspicion of mailing the devices, her family and officials said. Human rights groups named her as Hanan al-Samawi, a 22-year-old student. Her lawyer, Abdel Rahman Burman, told Reuters news agency she was a "quiet student and there was no knowledge of her having involvement in any religious or political groups". Officials later told the BBC that while Ms Samawi was being questioned, a shipping agent said she was not the individual who posted the packages, which were addressed to synagogues in the US city of Chicago. Investigators had concluded her identity was stolen by an individual who knew her full name, address and telephone number, they added. US President Barack Obama's counter-terrorist adviser, John Brennan, said both bombs - hidden inside printer toner cartridges - were built by the same man who made the explosive device used in a failed "underpants" bomb attack over Detroit on Christmas Day. Most of al-Qaeda in the Arabian Peninsula's more dangerous operatives are Saudis, driven out of their own country by a highly effective counter-terrorism campaign that has not yet been matched in Yemen. Some were released from Saudi rehabilitation centres for good behaviour and some have even spent time as prisoners in Guantanamo Bay, an experience that has redoubled their hatred of America and the West. Today, attention is focussing on an alleged Saudi bombmaker, Ibrahim al-Asiri, believed to be the man who built last week's parcel bombs. He's also thought to have designed the device worn by the failed Detroit bomber last Christmas. And in August last year he sent his own brother back over the border to try to assassinate a leading Saudi prince. The device he was carrying detonated, killing the would-be assassin, but the prince survived to continue his job as Saudi Arabia's counter-terrorism chief. All three contained PETN, and one of the detonators was reportedly almost exactly the same as the one used in the US attack. "I think that the indications are right now based on forensic analysis that the individual responsible for putting these devices together is the same," Mr Brennan told ABC News. "He's a very dangerous individual - clearly somebody who has a fair amount of training and experience." "We need to find him and bring him to justice as soon as we can." US intelligence officials earlier named the suspect as Ibrahim Hassan al-Asiri, a Saudi who is believed to be the main bombmaker for al-Qaeda in the Arabian Peninsula (AQAP), a regional offshoot of the militant network based in Yemen. He is also believed to have built the bomb his brother, Abdullah, used in an assassination attempt on the Saudi intelligence chief, Prince Mohammed Bin Nayif. The prince survived the suicide attack, in which PETN was also used. Mr Brennan also said the US and its allies could not assume that there were no other packages containing bombs out there. "So what we are trying to do right now is to work with our partners overseas to identify all packages that left Yemen recently, and to see whether or not there are any other suspicious packages out there that may contain these [Improvised Explosive Devices]," he told ABC. "We need to make sure that we get to the bottom of this, and understand who is behind it and what else we may be facing." US officials were re-examining the unexplained crash of a UPS cargo plane in Dubai in September to see if anything could be learnt, he added. However, the UAE later said investigators from its civil aviation authority had concluded that there was no "presence of acoustic evidence or any forensic signature supporting the detonation of an explosive device". 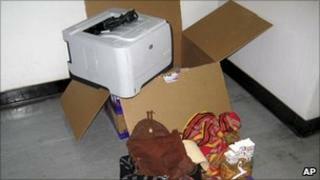 The two packages seized on Friday were shipped from Sanaa through UPS and another US cargo firm, FedEx. Qatar Airways was unable to confirm which type of passenger plane was used to fly one of the devices on from Doha to Dubai, but said it would have been an A320, A321 or Boeing 777. The firm also runs one freight-only flight a week from Sanaa to Doha. "Qatar Airways can confirm that a recent courier consignment was carried aboard one of its aircraft from Sanaa to Dubai, via Doha International Airport," said a statement on the airline's website. "The carrier stated that, as per Chicago Convention, it is not the responsibility of the country in which the cargo transits to x-ray or inspect the cargo. This responsibility belongs to the country from where the consignment originates. "Furthermore, the explosives discovered were of a sophisticated nature whereby they could not be detected by x-ray screening or trained sniffer dogs. The explosives were only discovered after an intelligence tip off." A second device was found at East Midlands Airport in the UK. Prime Minister David Cameron said on Saturday that the bomb seized in England was believed to have been designed to go off in mid-air.